To get this shot I had to stand waaaay back, which meant other elements like the trees on either side ended up in the shot too. At first I was a bit frustrated, and didn’t have a lot of time to mess around since I was on my way to work, so I thought I would turn this problem into an opportunity :) My solution was to use the surrounding elements to intentionally frame the student union in a way that added to the scale of what I was trying to convey. The structure itself with no foreground elements would probably have not been as interesting either, and in these conditions it ended up looking a bit like the Overlook Hotel from The Shining. I shot this wide open because I couldn’t be sure my aperture blades would close properly (I think I mentioned this in a recent post as well) but even so I’m quite happy with the overall composition. Everything was so far back that depth of field was not an issue, and the drop in sharpness that can happen when shooting wide open was not a problem because the whole scene was so foggy and dreamlike that a bit of softening actually added to the mood. Like ‘m both – there’s a sense of mystery in the fog! I also prefer the first scene as it feels inclusive, as if I belong there, whereas the second scene leaves me as an observer. That’s kind of my opinion too, Yvonne. I like them both for separate reasons, but it really does feel like I’m more…present in the first one. Shot # 1 much preferred. The trees, as well as framing the building, also serve to guide the viewer’s eyes towards the structure. Interesting point about how the trees help guide the viewer’s eyes toward the building, Chris. I don’t know if I thought about it from that perspective before. Thank you! I like both shots. In the top shot, I think the trees work for you. They do give a sense of scale, as you said. They also give a sense of depth, as they are not as misted over by the fog. I, too, prefer the first shot. 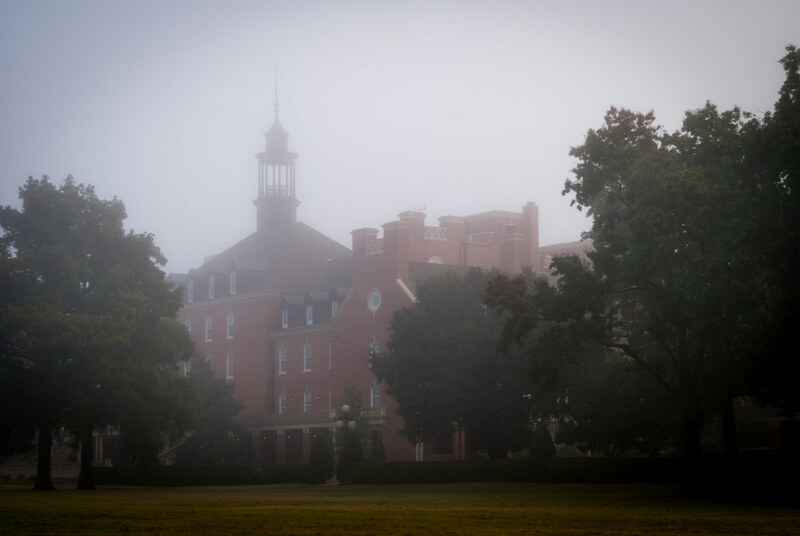 It gives the fog, the building and the trees a cozy feeling. The second shot seems to be about the round flower planter in the foreground making the building, trees and fog insignificant background. I want to thank you for this blog because I find it so helpful. I am just beginning to use the 50mm and find it challenging.